But with the financial crisis abating, this process is going into reverse. 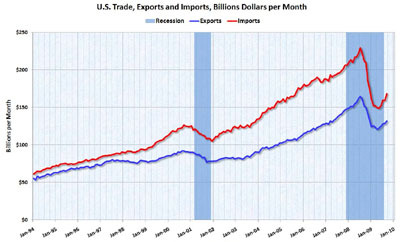 Last week’s U.S. trade report showed a sharp increase in the trade deficit between August and September. And there will be many more reports along those lines. So picture this: month after month of headlines juxtaposing soaring U.S. trade deficits and Chinese trade surpluses with the suffering of unemployed American workers. If I were the Chinese government, I’d be really worried about that prospect. Unfortunately, the Chinese don’t seem to get it: rather than face up to the need to change their currency policy, they’ve taken to lecturing the United States, telling us to raise interest rates and curb fiscal deficits — that is, to make our unemployment problem even worse. And I’m not sure the Obama administration gets it, either. The administration’s statements on Chinese currency policy seem pro forma, lacking any sense of urgency. ….Early Monday, a spokesman for China’s Ministry of Commerce added further criticism of the Obama administration, targeting recent measures by Washington against Chinese exports. “We’ve always known the U.S. and the West as free market economies. But now we’re seeing a protectionist side,” the spokesman, Yao Jian, told a monthly press briefing. Mr. Yao also rejected criticism of China’s currency policy, saying the yuan’s exchange rate has little to do with trade imbalances with the U.S. and that China should keep the exchange rate stable. At some point our trade deficit has to turn around. The Chinese obviously don’t want to be the ones to take the hit for this by strengthening their currency and damaging their export-based economy, but they really don’t have much choice about it. The global economy is going to be rebalanced one way or another, and it can either happen gradually or it can happen suddenly. The latter would be no fun for anyone, China included. Better to take Door #1 instead.